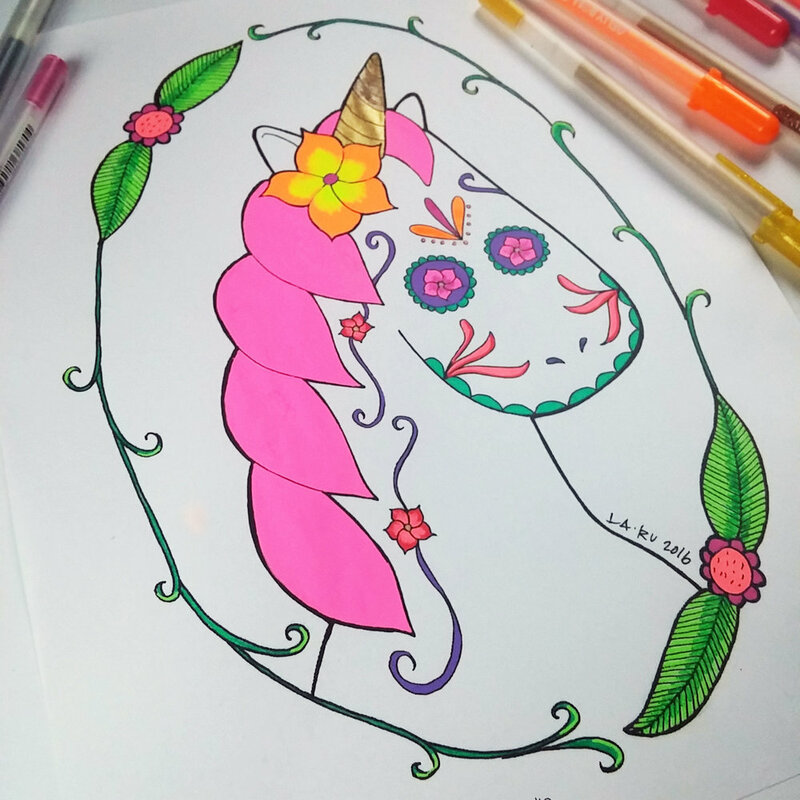 Enjoy a free coloring sheet of a La Ru Day of the Dead Unicorn. Inspired by a Halloween window display I created for my shop Ugly Baby and La Ru. Please post pictures on social media of your finished piece or your in progress shots. Be sure to tag @larudio on instagram or twitter or LaRu on facebook. On October 24th, 2016 I will randomly select a winner; you'll get a letter from me with a bunch of La Ru stickers! This coloring sheet is for personal use only. It cannot be sold or created into another item to be sold. Your contact information will not be sold or added to any lists; I will only use it to notify a winner. If you'd like to join my email list, fill out the La Ru VIP Club form to the right. Thank you! Click here to download your coloring sheet! 1. Flip through a magazine until you find a pattern or image that you like. 2. Trace the bezel cup on the magazine page. (Tip: I found that using a Sakrua Microperm or Micron pen works well as it does not smudge if you move the bezel cup by accident.) Don't worry if the lines are not perfect, you will be cutting them off so they won't show. 3. Cut out the image. The clipping will be slightly bigger than what you need; slowly trim off the edges until you get it to fit in the bezel cup. This make take a few tries. (Tip: If you are going to make lots of images for your particular sized bezel cup, I recommend make a template out of card stock, so you can trace the template rather than the bezel cup. It is a little more accurate. 4. Once you have your magazine piece cut out, you can draw on it and decorate it with pens. To add bright colors, I like using Sakura Gellyroll Moonlight pens. In this example I used: They blend well and "paint" on. Make sure to let them dry so they don't smudge (it only takes about 30 seconds to dry). You can also use Microperm or Pen-touch pens to decorate your image. The Pen-touch pens require a little more drying time. 5. Once your image is finished, skip below to the finishing instructions. 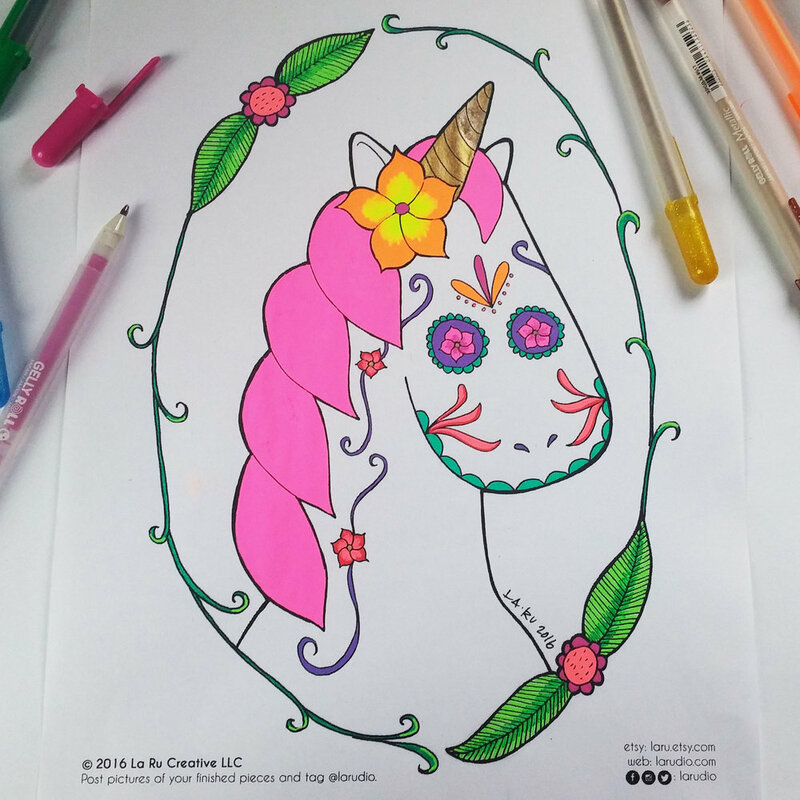 I used the Sakura Gelly Roll® pens in colors: Moonlight Fluorescent Yellow, Moonlight Fluorescent Pink, and Moonlight Purple on this example. I have found that thicker shiny paper works well with resin. Matte paper can sometimes fall apart with the process. 1. Trace the bezel cup on the paper. (Don't worry if the lines are not perfect. You will be cutting them off so they won't show. 2. Cut it out. The paper will be slightly bigger than what you need; slowly trim off the edges until you get it to fit in the bezel cup. This may take a few tries. 4. Once your image is finished, skip below to the finishing instructions. I layered Pentouch® and Gelly Roll® pens, then added black lines over the color ink with a Microperm® pen. This picture shows the image before adding the black lines. 2. Once your image is finished, following the finishing instructions. 1. Using Mod Podge and one of your small paint brushes, coat the inside of the bezel cup. Make sure to get all the edges and corners. You only need a thin layer. 2. While the Mod Podge is still wet, stick your image in the bezel cup and push down. Hold for a few seconds. You can use the end of your paint brush to gently push down the edges and corners. Some Mod Podge will spill out to the front of your image - this is okay! The Mod Podge dries clear. Make sure to press down the corners and edges. You can use the end of your paint brush. The Mod Podge will spill out around your image - this is okay - it dries clear. Coat the top of your image with Mod Podge. This is what the pendants look like when the Mod Podge is wet. This is what the pendants look like after the Mod Podge is dry. The minimum amount of resin you should pour is 1/2 tablespoon. Mark your mixing cup with a permanent marker (Sakura Mircroperm® works great!) at the 1/2 tablespoon mark and the 1/4 tablespoon mark. Optional Step: put on rubber gloves and respirator mask. "Paint" in the resin. Be careful not to over fill the bezel cup. For this tutorial I put parchment paper on a piece of cardboard, to create a backer for the pendant so I could pour the resin on a flat surface. I taped the parchment paper down with washi tape. This is helpful if the eye of the pendant is large than the cup. You can push the eye into the cardboard so the pendant lays flat. 7. Once the resin is poured, check for bubbles. Small bubbles will typically rise to the surface, but large ones need to be popped. You can use the end of your paint brush, a sewing pin, or even a paper clip. For tiny bubbles, you can try using a heat gun to help raise them to the surface. On the lowest setting hold the heat gun about 6-12 inches above the pendant. (Tip: Don't move the heat gun fast across the pendant because it can cause the resin to blow over the lip. Pro Tip: Keep your heat gun clean because it can blow tiny fuzz bits into the drying resin which are really hard to get out.) The heat gun also helps start to set/harden the resin. If you don't have a heat gun you can also breathe on it, similar to when you breathe on a window to fog it up to write on (open mouthed and a ha-ha breath). You don't want to really be hovering over your piece breathing in a lot o the resin fumes, so when I do this I try to do it quickly to get most of the bubbles out. The rest of the bubbles usually work themselves up to the surface. 9. Once it's dry, string on a necklace chain and enjoy! Sakura Pens: Gelly Roll®, Micoperm®, Pentouch® and many other cool pens. Rings and Things: Sells bezel cup pendants, cuff links, belt buckles, earrings, necklace chain, and mixing cups. Ice Resin: There are lots of different types of resins you can experiment with, but I prefer Ice Resin. Ice Resin also has tutorials, videos, and example projects on their site. Disclosure: Sakura America gave me pens to experiment with for this resin tutorial. Thank you Sakura! I wrote this tutorial a couple years ago (originally posted on the Ugly Baby and La Ru blog) after Epson sent us a LabelWorks Ribbon Printer to test out. One of the projects I came up with were Felt Fortune Cookies. This year, at Craftcation, I am teaching how to make Felt Fortune Cookies and Epson was kind enough to donate six printers for the class! I will be giving away a few at the end of my class and a few will be given away on the dearhandmadelife blog. I thought it would be fun to re-post this this tutorial since it is such a fun project. Trace the circular object you are using as a template onto the felt. Cut out the felt circle. Fold and pin in half. Draw a line from the center of the half circle toward the top of the arch about a half inch (or about half the arch depending on the size of circle you cut out). Cut about 20” of embroidery thread, separate and use 3 strands. Thread a needle and knot at one end. Stitch along line. Compose a fortune for your fortune cookie. In this example I used “You will meet a new friend today. Type your message on the Epson LabelWorks Printable Ribbon Kit. You can choose the font, the font style, and even add some cute symbols and borders! When typing up your message make sure to add a few spaces (about five) before your message so there will be enough space in the ribbon once sewn in the fortune cookie. Line up the ribbon with the fold of the fortune cookie (the top of the ribbon should line up with the edge of the half circle, with the beginning of the ribbon closest to the stitched line). The beginning of the ribbon should overlap the line slightly. Stitch along the line to attach the ribbon. Open the folded circle and then fold in half (opposite to first fold). Match up edges and pin. Using the other half of the 20” embroidery thread (3 strands), knot one end and thread the other. Starting at one side of the fold, Blanket stitch the 2 layers together until you get about 1 inch from the other side of the fold. Once you are about 1” away, Blanket stitch along a single layer of felt until you reach the other side (where the 2 layers are stitched together). Knot and cut thread. Roll up the ribbon and tuck into fortune cookie. You can cut the end of your ribbon either at an angle or like a V for a finishing touch. These fortune cookies make great handmade party favors. They are also a neat way to tell that special someone how much you care for them. Set them out on the tables at your wedding or hide them around the city with secret messages hidden inside. Want more information on the Epson LabelWorks Ribbon Printer? Check out Epson's website here. If you have questions feel free to leave them in the comments section and I will help you out. Happy Halloween! Create a Felt Sugar Skull Friend with this free downloadable template! 1. Print out provided pdf pattern. 2. Cut out the pattern and then lay the pieces on top of felt. You can pin them, but since they are small I just held them in place. 3. Cut out the Skull in one felt color. Cut out the background in the second felt color. 4. You can either embroider free hand or trace the pattern onto the Skull pieces to help guide you. I traced the eyes to help me stitch the circles. 5. Using a Back Stitch, stitch two circles for eyes. 6. Stitch back around the eyes using a Lazy Daisy Stitch. 7. Use a Back Stitch to form the mouth. 8. To make the teeth, use a Lazy Daisy Stitch. To create the nose, also use a Lazy Daisy Stitch, Tip: have the ends met so they form a point at the top of the nose. 9. Create three dots under the mouth using French Knots. 10. For the web, I used a Back Stitch. First I created the radiating lines, then stitched the connecting web lines. 11. Place the Skull on top of the Skull background. Use a Straight Stitch to tack down the Skull to the Background. Once tacked down, trim background piece if needed. The Skull face is just a suggestion. You can create your own unique Sugar Skull using whatever stitches you prefer. Here's an example of another one, using a few different stitches. Turn it into a broach: Stitch a pin to the back into a broach. Make it into a headband: Using wide elastic measure your head and be sure to give yourself an extra half inch or so, so you can lap it over and sew the elastic together. Once the elastic is sewn in a loop, stitch the Sugar Skull Felt Friend onto the headband. Be sure to only stitch through the Bat Background piece and not all the way through to the front of the Skull. Make it into a key chain: Cut out a second Skull Background and a tab for a key chain (provided in downloadable pattern). Loop the tab over the key ring and sandwich between the finished Skull Felt Friend and the second SkullBackground. Whip stitch or blanket stitch around the perimeter. La Ru Halloween Bat Friend! 3. Cut out the bat body and bat wings in one felt color; I chose gray. Cut out the background in the second felt color; I chose pink. 5. Once the wings are stitched on, lay the bat and bat wings onto the background. Use a back stitch to go around the bat. To embellish the wings you can do a straight stitch (looks like a dotted line) from the points of the wings to the arm pit of the bat. 6. For the eyes make two French knots. 7. Using a different color embroidery thread such as white or red stitch two triangles for the fangs. Make it into a headband: Using wide elastic measure your head and be sure to give yourself an extra half inch or so, so you can lap it over and sew the elastic together. Once the elastic is sewn in a loop, stitch the Bat Felt Friend onto the headband. Be sure to only stitch through the Bat Background piece and not all the way through to the front of the bat. Make it into a key chain: Cut out a second Bat Background and a tab for a key chain (provided in downloadable pattern). Loop the tab over the key ring and sandwich between the finished Bat Felt Friend and the second Bat Background. Whip stitch or blanket stitch around the perimeter. Next post I will show you how to make the Sugar Skull with another free downloadable pattern. Want to join the La Ru VIP Club? In addition to getting a welcome coupon code, you will also get exclusive sneak peeks to new projects, giveaways, and secret sales! La Ru respects your privacy and will never sell your information. Thank you for joining the La Ru VIP Club! You will receive your coupon code shortly.